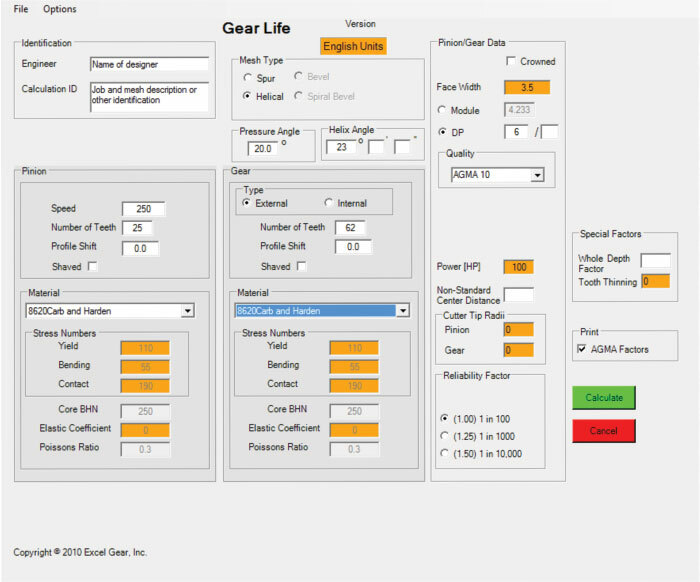 In response to the gear market’s need for optimization software, which has been lacking for many years, Excel-LentTM gear/gearbox design and analysis software has been developed by Excel Gear, Inc. (Roscoe, IL) and written in Visual Basics.Net. This software has been written by engineers who also design and manufacture gears for their own use, according to company president N.K. “Chinn” Chinnusamy. DESIGN: This section calculates the size of gears, based on minimal input by the user. The user needs to specify only the input rotational speed, gear ratio, power to be transmitted and the material and heat treatments selected from the material tables of all commonly used materials in the industry. Key values calculated are the diameter and face width of the pinion required to achieve the surface fatigue power rating and optimized DP or module (based on the calculated diameter) required for the bending fatigue power rating. The data are automatically exported to the analysis program for detailed analysis. The results are the power ratings for 5,000 -100,000 hours of B1 life (reliability factor of 1). 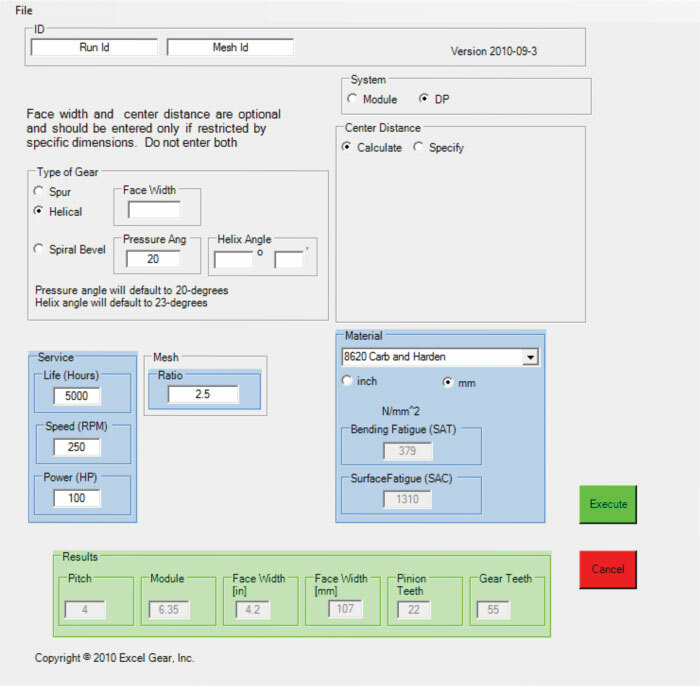 If required, other values such as face width or center distance may be entered but Excel Gear recommends leaving the face width and center distance values blank for optimized gear design. Design and analysis programs are used to design one gear stage in sequence on an external or internal spur and helical gear mesh. ANALYSIS: This program calculates the power rating of a gear set for 5,000, 10,000, 25,000, 50,000 and 100,000 hours of B1 life (reliability factor of 1). Reliability factor of 1, 1.25, or 1.5 can be selected, as required. The user needs to input mesh type (spur, helical, internal and external), pressure angle, helix angle (if applicable), pinion speed, number of teeth in pinion and gear, material (from the list provided in the software), face width, DP or module and quality required. Crown and/or profile shift, if used, can also be entered. The program will calculate the power rating of the gear set and show HP or KW capability along with torque, tangential force and static capacity. Static capacity is based on yield strength and, if bending stress exceeds yield strength at any time, permanent deformation or even tooth breakage may occur. If the results are satisfactory, the user can print the single page results only or, optionally, also print all the AGMA factors used in making the calculations. Most commercially available gear software will generate five or six pages of output along with required bending and surface fatigue strength of the gear set. The user therefore needs knowledge of metallurgy to select proper material and heat treatment or must consult a metallurgist. By contrast, the Excel-Lent software program lists commonly used gear material for the user to select. If the results are not as required, the user can select another material or change other design criteri a as required to achieve the desired results. If a special material is desired, its yield, bending and contact stress numbers can be easily entered. If any of the required input data are missing, the program will prompt the user to supply what is missing. Metric or inch units can also be selected with just one click. DIMENSIONS: In the opinion of the manufacturer, this Excel-Lent gear dimension software is the most versatile program available in the market. The program will calculate the manufacturing dimensions for a new pinion and gear or calculate the dimension of a pinion or gear to mate an existing pinion or gear. This can be done for external gears, internal gears or a gear rack. Users need only to enter the type of mesh (spur or helical, internal of external), pressure angle, helix angle(if helical gears), number of teeth in pinion and mating gear, DP or module and the quality of the gears. The program will then calculate the center distance, dimension over pins, span measurement, form diameter, roll angles and all gear tolerances to match the quality required (AGMA, DIN, or ISO). The program will calculate the helix angle required to match a specified center distance if the user chooses that option. The program calculates optimized profile shifts for pinion and gear operating at a non-standard center distance, if the operating center distance is specified. If the profile shift required to operate is large and makes the top land narrow, the program will flash warning messages and display the proper profile shift amount to avoid narrow top land. Excel-Lent software further provides users the option to balance beam strength or specific sliding of gear and pinion, if desired. This is a key requirement for wind turbine gears. The program will also calculate gear blank tolerances to achieve the desired quality level, if shaft and bore diameters are entered. Users can switch between inch and metric dimensions with one click.